It was a warm afternoon in Melbourne, and I was in a suburban hotel in South Melbourne with tables and chairs on the pavement. It had been a long day of gasbagging at work and I was flagging. What was required was a big, thirst quencher of a beer, and fortunately the Montague Hotel had it waiting. 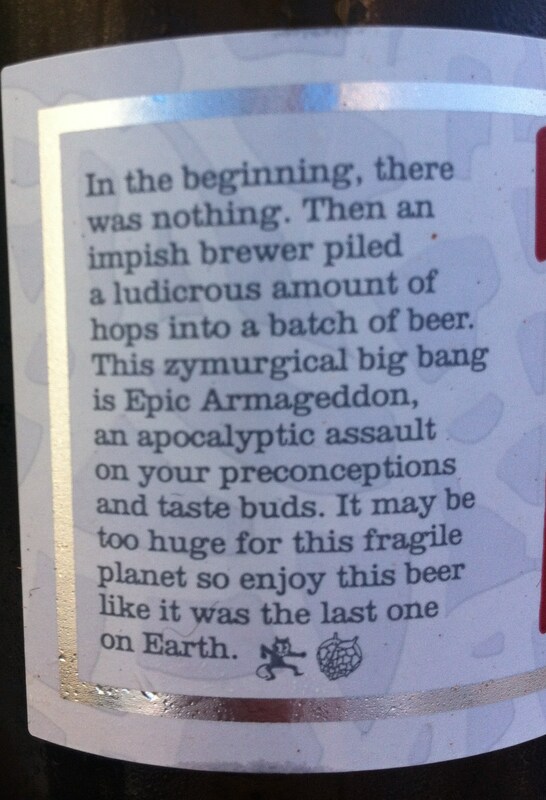 Epic Brewing Company’s Armageddon IPA is one of the finest beers I’ve tried. It lives up to the lofty promises it makes on the label and delivers before, during and after you drink it. Epic Brewing Company’s website is one worth visiting. It reveals a brewery that has a fine, irreverent sense of humour, but also has all the deep knowledge and passion of a fine master brewer. 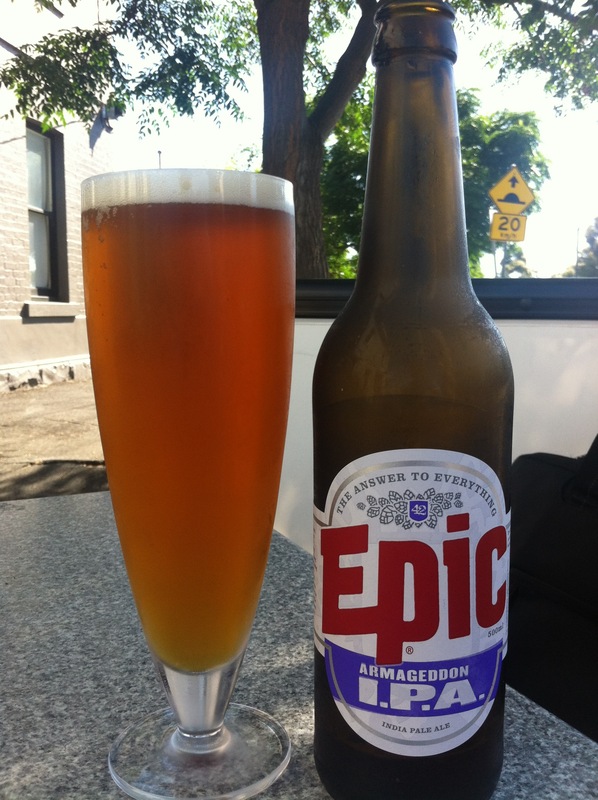 There’s a blog to which you can subscribe and they claim to be the first brewery on Twitter (@epicbeer). They’ve also built up a reputation in the US having collaborated on a beer with high profile brewer Dogfish Head. Plenty of awards and the Armageddon IPA has been judged New Zealand’s best IPA for 3 years running. So, what’s the hype all about? Firstly, this is a confident beer – “The Answer to Everything” proclaims the label. Secondly, I just love a 500ml bottle and the barman at the Montague gave us two chilled glasses to keep things cool. Thirdly, the colour is just classic – deep amber. Fourthly, the aroma is big – not as massive as some – but you know you are about to engage with hop heaven. Fifthly, it is a taste sensation. It’s a sharp start, but it just keeps cranking up the longer you drink it. Lastly, the finish keeps going and going. 20 minutes after my last swallow, the hoppy bitterness was still playing around in my mouth. It is indeed as the label promises “a Zymurgical big bang” (I reckon that should be zymological – of the chemistry of fermentation). A candidate for “If you had to have one last beer, what would it be?” for sure. At 6.66% alcolhol, you’d be comfortably numb to whatever the Apocalypse threw up anyway. PS: I’ll get back to the Montague for a meal at some stage. 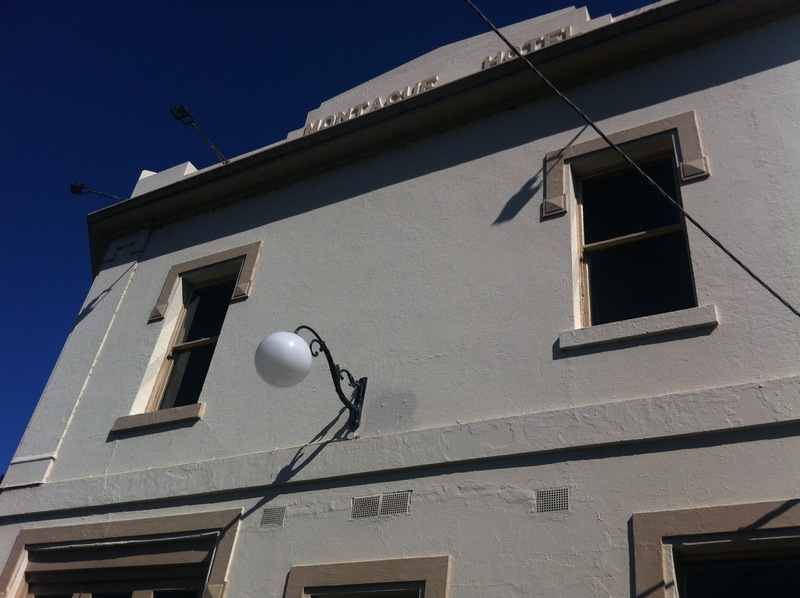 It’s connected to the Courthouse in North Melbourne, which has given me a couple of great food experiences. Menu looked good.